Changes to the Rose Bowl field include new approach using top-rated Kentucky bluegrass varieties from Mountain View Seeds. 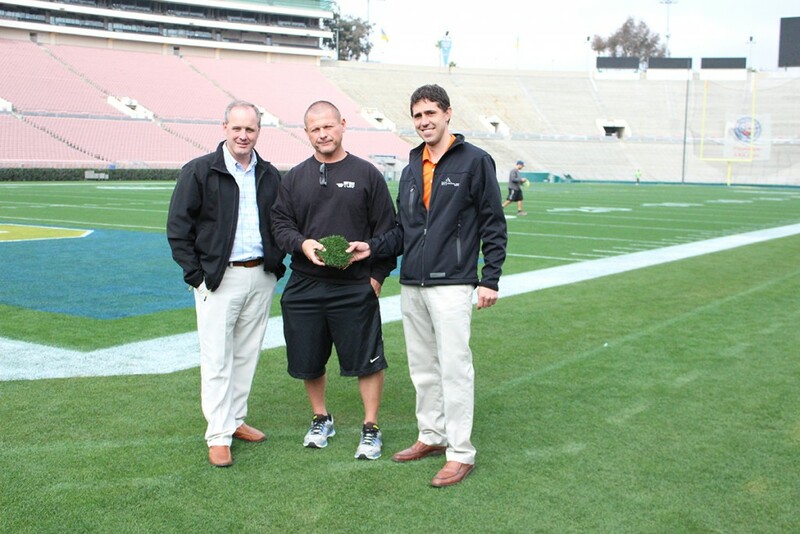 After more than a year of on-field trials and testing, Will Schnell, Head Groundskeeper, has selected Mountain View Seeds to be the official seed supplier to the Rose Bowl. Mountain View Seeds will provide the seed used on the Rose Bowl for the NCAA championship game. Schnell made the decision to convert the Rose Bowl from a bermuda grass base overseeded with perennial ryegrass to a 100% Kentucky bluegrass sod for the Rose Bowl game for its superior density, tensile strength and ability to recover quickly after use. Schnell explained that the bluegrass sod is ideal for use during their 6-month cooler season from November through May. At this time UCLA plays and the annual Rose Bowl game takes place along with other major events. “During those months, in this part of California, it’s great bluegrass growing weather,” said Schnell. The Rose Bowl is used roughly 300 days each year. In addition to the football season, the field is used for filming television ads, movies, and numerous events including soccer tournaments (2016 America’s Cup), concerts and even a moto cross event. When Schnell began researching new species and varieties for the Rose Bowl, he relied heavily on the National Turfgrass Evaluation Program (NTEP). The NTEP reports provided him with University data to make unbiased comparisons between cultivars. He noticed that Mountain View Seeds’ Kentucky bluegrass varieties consistently ranked at the top of the NTEP lists. After discussions with his partners at West Coast Turf, Schnell made the decision to plant a trial of 365 SS that would eventually be chosen for the Rose Bowl. After evaluating the test plots growth pattern and testing its strength, the decision was made to grow a field for use. Mountain View Seeds worked with West Coast Turf and Schnell to grow the sod that would eventually become the Rose Bowl game field. Constant attention was paid to every aspect of growing the sod to ensure the highest quality product was delivered to Pasadena. Twenty-four truckloads of sod were used and the field was laid in 24 hours. The management practice used at the West Coast Turf sod farm in southern California was identical to the management practice Schnell would use at the Rose Bowl. This ensured a smooth transition when the sod was installed in Pasadena. Every detail was managed for optimum success, including matching the soil profiles at both locations. This partnership marks a continued focus on top-quality customers for Mountain View Seeds. These partners include Shinnecock Hills (host of the 2018 US Open), Dodger Stadium (home of Major League Baseball’s LA Dodgers), FedEx Field (home of the National Football League’s Washington Redskins) and even The White House. “Being part of Will’s winning team really means a lot to our group,’ said Troy Kuenzi, President and CEO of Mountain View Seeds. “We pride ourselves on providing the best quality products to all of our customers and that’s something we have in common with Will and the Rose Bowl. We look forward to many years of success as partners.” said Kuenzi. Mountain View Seeds is a global grass seed research, production, packaging, and marketing company. Based out of Salem, Oregon; in the heart of the Willamette Valley and the grass seed capital of the world, Mountain View Seeds provides top-quality varieties to customers around the world that demand the best cultivars.